With the iPad, note taking is made much easier. As is taking your music and movies everywhere. There are many ways it can save you money and make your life easier. 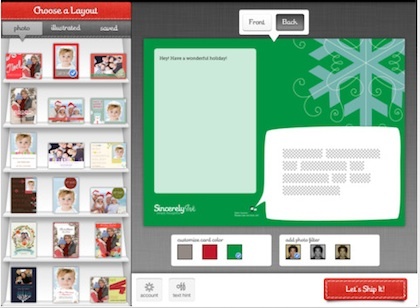 One, is the ability to create print cards on the go… and let someone else print and mail the cards for you. No need to go to the store and buy ‘off the shelf’, no need to hunt down a postage stamp and post office! Sincerely Ink on the iPad and iPhone is one option that will take will help you spread the joy with very little work. The free universal app has over 30 different card layouts. 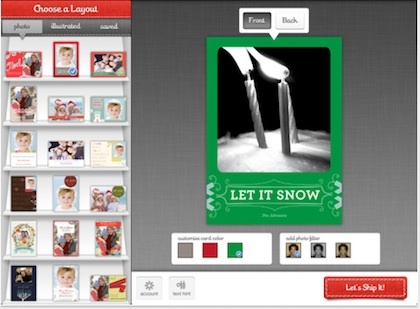 You choose a card layout, use the included art or use an photo of yours, then edit the text. When done, the Sincerely Ink app will send your creation to the Sincerely service that prints and mails the card for less than two dollars. A full size 5X7 card. You can enter an individual address or grab your address lists from your iPad’s contacts lists… no one needs to know how fast and easy the card was to make and send!